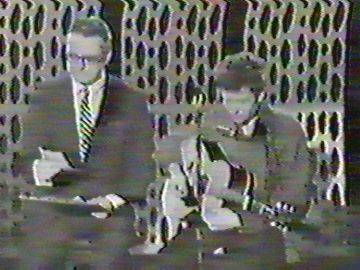 You really should watch Bob Dylan’s appearance on the Steve Allen show from February 25, 1964 (shortly after he appeared on CBC’s Quest). Not just for Dylan’s performance of “The Lonesome Death of Hattie Carroll”, but for how utterly, totally bizarre the interview is. Allen introduces Dylan, throws to commercial, comes back, reintroduces him, reads a review, asks him a question, reads one of Dylan’s poems, and then asks him about Hattie Caroll – suggesting that Dylan tell the audience about her, which, of course, is what the song does. Allen seems totally lost: “Well, I imagine the song tells it’s own story,” he says. I think talk show prep left a little to be desired in the early 1960s. What is striking, though, is how hard Allen pushes him not just as a singer-songwriter or folk star, but very consciously as a poet. Allen calls him a poet, quotes a review that calls him a poetic genius, and then actually reads Dylan’s poetry aloud himself. By 1964 Dylan was self-consciously positioning himself this way, not simply in the way that he was using Rimbaud-ian imagery in his songs, but through the inclusion of things like “11 Outlined Epitaphs” on the back cover and insert on The Times They Are A-Changin’ (my insert, by the way, is gone from my vinyl copy – I had to read the text online). Dylan wrote poetry earlier – he ended his Town Hall concert in 1963 with “Last Thoughts on Woody Guthrie” and apparently wanted to include that reading on a potential live album in 1964, which became a stumbling block with his label. I have a tough time gauging his non-musical verse. It can be quite evocative, but it mostly leaves me cold in comparison to his songwriting. There is an argument to be made (and it has been made) that the collapse of poetry as a popular art form owes a great deal to Dylan and Paul Simon and Leonard Cohen raising the stakes in pop music by incorporating poetry into their songwriting. The turn towards difficulty, abstraction, and conceptualism that marked poetry over the past half century can be read as a reaction to the appropriation of lyrical poetry by pop music. As a certain kind of poetry moved into the university’s creative writing programs, popular verse moved into the musical realm. The combination of music and poetry had been one of the goals of the Beats, of course, and when Dylan and his colleagues began to achieve it, it forced the poetic avant grade to move towards non-expressive forms. I’m simplifying horribly, of course, but it is striking how far the cutting edge of poetry in the late-1960s and after would move away from the types of things that Dylan and Simon were able to write. Every year now Dylan is mentioned as a potential Nobel Laureate for his poetry, by which the critics usually mean his songwriting. It always seems like a long shot to me, but I do think that his impact on the world of poetry has been profound – not simply because people followed his example, but because an even greater number of poets ran from it. Here is Dylan on Steve Allen found on Facebook – you might need to be registered on Facebook to be able to watch this.